At Union Square Design we use Magento. Magento is a content management system (CMS) platform, specifically for companies who sell goods. E-commerce companies primarily use Magento. We at Union Square Design have used Magento to build online marketplaces for our clients. We have used Magento for clients such as Crumbs Bakeshop and Glock. So, why do we use this e-commerce platform? Well, because it is the number one CMS platform for the e-commerce community. On June 7, at the Internet Retailer Conference and Expo in Chicago, it was revealed that Magento is ranked number one in online retail. This is the fourth year in a row Magento has won this. According to Yahoo Finance, “31% of mid-to-large companies rely on Magento for their commerce platform, more than any other vendor including Demandware and Hybris. Further, Magento now powers over 25% percent of all e-commerce sites in the Alexa top one million sites list, more than any other e-commerce platform”. This means that overall, one-fourth of all e-commerce companies use Magento. 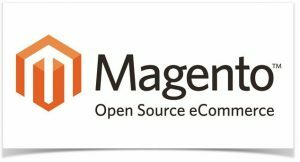 Overall, people like Magento because it is simple, and easy to learn. This e-commerce platform is loved for it’s powerful content management system and shopping cart.